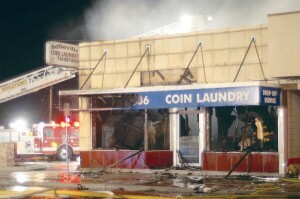 Belleville fire fighters called for help from Van Buren, Pittsfield, and Sumpter townships and the City of Romulus to fight a fire Monday night, March 21, at Belleville Coin Laundry on Main Street. Witnesses saw flames inside the front, north window at about 9 p.m. The origin of the fire is yet to be determined. 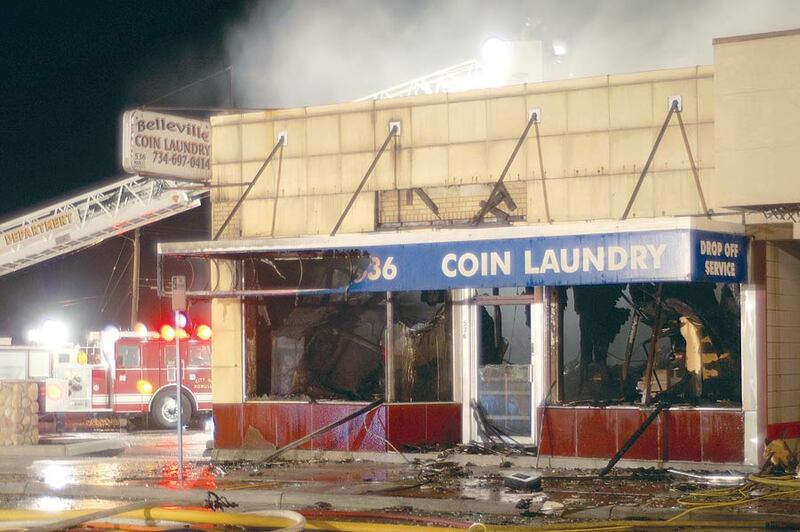 Belleville Fire Chief Lee Grant said he called in the Michigan State Police to investigate because it was a large commercial loss and the MSP was due to be at the scene on Wednesday. Main Street was shut down to traffic from the bridge to Fourth Street as all the fire equipment set up on the street with fire fighters and hoses everywhere. Chief Grant said he called for help from Pittsfield and Romulus, mainly because he needed their ladders. Chief Grant works nights at his real job, but he left work early to take over command of the fire-fighting efforts. 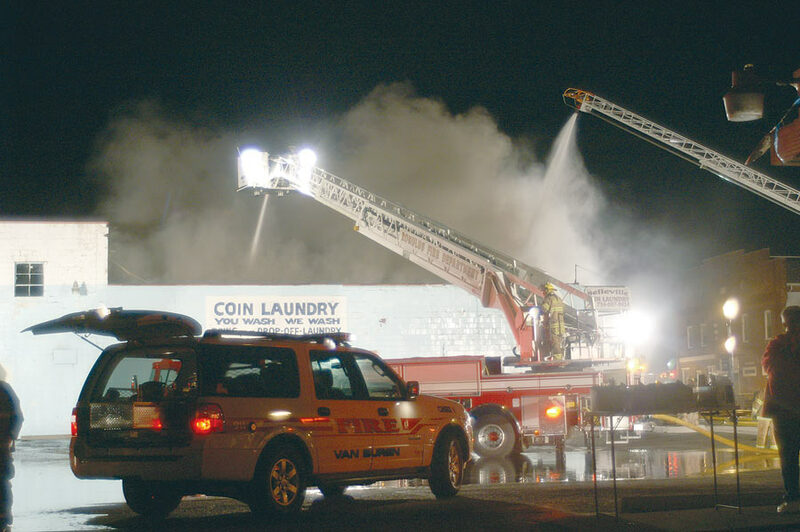 The fire spread to the upper floor in the cement block building and the ladder trucks from Van Buren Township and Romulus sprayed the roof from above. Belleville Mayor Richard Smith said Van Buren Township called him and Mayor Pro Tem Rick Smith, and the two, with their wives, went to the scene. Mayor Smith said he didn’t get home until about 12:30 a.m. Tuesday. John Dakis has been renovating the former Red Beans and Rice restaurant in order to open his own restaurant, Belleville Charhouse, just two doors down from the fire. He couldn’t resist entering his storefront to check on it during the fire and he was scolded by fire fighters when he emerged. 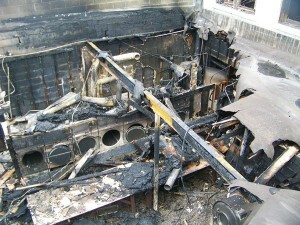 He reported the smell of smoke inside, but no damage he could see. The man who regularly vacuums out the dryers reportedly had completed his task at 5 p.m. that day and the laundromat usually closes at 8 p.m.
A woman playing in a pool league at Lakeview Tavern said players were advised to go outside and make sure their cars were all right in the parking lot, which is next to the laundromat lot where some of the fire fighting was taking place. She said when it was time to go home, she couldn’t drive to Sumpter down Main Street, as she usually does, and was directed to the I-94 South Service Drive and Haggerty. During the fire fighting, the water put on the building made a large lake in the adjoining parking lot where the drain couldn’t handle it all at once, according to witnesses. Chief Grant said that the scene finally was cleared at 5 a.m. Tuesday. Balfour came to board up the building within an hour of being called, he said. He said he went to bed and wondered why the news media weren’t calling him. Later in the morning he realized that he left his cell phone in his turnout gear and there were many messages waiting. At about 9 a.m. Tuesday City DPW Director Keith Boc walked around the building, checking out the damage. He said eventually he will be able to get inside and inspect the building to determine if the building has to be demolished or can be repaired.